There are variables to the following general observations about English Cream Golden Retriever personalities. They vary depending on the environment during the formative days, weeks, and years of a puppy’s life. They are perhaps the innate characteristics which when nurtured will develop and endure. Understanding your puppy's natural personality will help you to create and maintain an atmosphere which will nurture and support positive self confidence, social development, and the natural personalities which compel our adoration. Golden Retrievers are Pack and People oriented dogs. They enjoy being in the company of members of the family and other pets in the home. Include your puppy in the family's daily routine. He/she is a part of the family and will enjoy playing while you are at play, resting while you are at rest, spending time alongside family, other pets, and being involved encourages team work and motivates a growing bond. Golden Retrievers have a desire to please. This is why early positive praise for behavior you are pleased with will build your puppy’s self confidence and encourage more pleasing behaviors. They adjust best when there is a routine and daily activities, such as play time, walking time, or nap time, can be anticipated. Routine gives our pets a sense of security. They recognize when to expect a change in the routine throughout the day. Making him/her a part of the transitions throughout the day will reinforce the sense of security as well. English Cream Golden Retrievers enjoy activity such as walking and playing. As they grow up their level of activity will increase. For the first 18 months ensure exercise isn’t exhaustive or forced. This will allow their bodies to fully develop before you take them on longer walks or jogging with you. 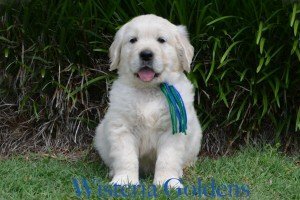 As you make your English Cream Golden Retriever a part of your life, your home, and your family, you will be creating an environment and a lifestyle which will instill personality traits to encourage for years to come.